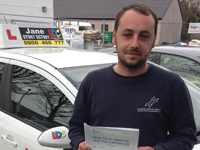 After being let down by previous instructors at a different company I failed my first driving test. I then looked for a new instructor for test cover and found Jane online. Jane was extremely busy when I first contacted her. Her response was prompt and extremely supportive. As soon as I met Jane I immediately felt at ease. She was extremely friendly and her teaching methods were excellent. 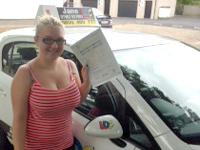 I only had three lessons with Jane and I then passed my test which I was ecstatic about given my circumstances. After my first lesson with Jane I recommended her to a friend as I was so happy with the learning I had gained in so little time. My only regret was that I didn't take all my lessons with Jane. 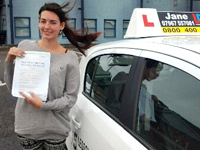 Excellent driving instructor and has the most friendly and professional manner at all times. I will continue to recommend Jane in the future. 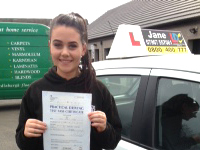 Jane was brilliant, punctual and offered a great learning environment and her experience showed through out. 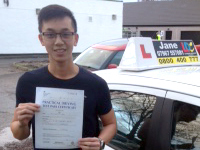 I passed my test first time with only 23hrs tuition and would like to take this opportunity to thank Jane and would highly recommend her. 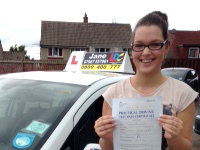 Thanks to Jane I passed my test first time and with only 2 minors! I had taken a long break between learning to drive and decided to do an intensive course. Jane was highly recommended by a couple of my friends and they were definitely right. Jane is so lovely and patient. She makes sure that you have perfected each topic before moving on to the next. 100% recommend her to anyone who is either starting from scratch or looking to go intensive! 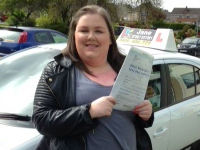 I was with Jane doing my lessons from October to Feb. And I passed with her 1st time. I did 2 hours a week and she is so patient and explains things and answers any questions if you have any. She also takes a note of everything we do in lessons and she is really professional and doesn't waste time on lessons as more instructors do. I would really recommend going to Jane for lessons. If she can make me pass, she can make anybody pass! 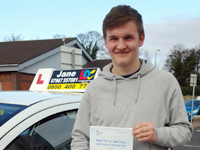 Thank you so much for helping me pass first time. You have been the best instructor. See you on the roads, toot toot! Jane is the best instructor I've ever had! She is patient, calm and makes driving fun. She is organised, friendly and puts you at ease. Thank you Jane. Jane was an amazing instructor who always made me feel confident and at ease. 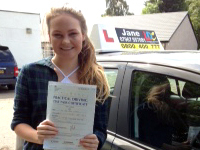 Thanks so much Jane for helping me pass first time, you've been great! Jane was an excellent teacher and I would highly recommend her. 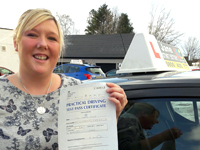 I have greatly enjoyed my time learning to drive with Jane she is a fabulous teacher and I am very happy I was able to achieve a first time pass after only six lessons. 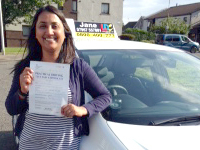 I am incredibly pleased that I met Jane and all thanks to her I passed first time. Jane is very patient and will never get you to do something you are not comfortable with. Thanks again. I was recommended Jane by some pupils of hers and decided that with my busy work schedule that intensive was the best way for me to learn. The intensive lessons got me familiar very quickly and allowed time for us to practice manoeuvres over and over again till I was doing them perfect! After a few lessons I started to get confident and Janes calm and friendly manner made lessons and the test day a breeze! 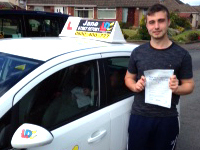 Thanks Jane for getting me a first time pass! Jane is the most relaxed and lovely instructor. Doing the intensive course with her was super easy and so quick to pick up. 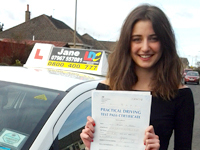 I couldn't have asked for a better instructor and would highly recommend her to anyone looking to drive. Simply the best! 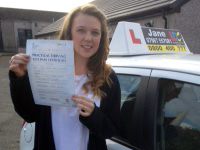 I would like to thank Jane very much for helping me through my driving. I thought she was an excellent teacher and her teaching methods were very understandable. I'm glad I chose Jane. Jane is an extremely brilliant driving instructor. Highly recommend to anyone. 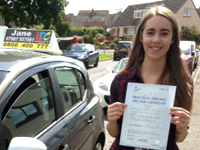 First time pass thanks to her. Thank you Jane. 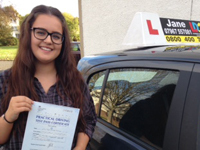 So pleased with my driving lessons with Jane. 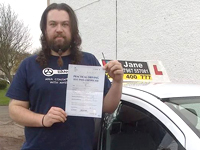 Lovely, calm, patient driving instructor. I passed second time and I'm so happy with the rate at which I learned to drive having had no previous experience in a car. Thank you so much. I would definitely recommend Jane to everyone. 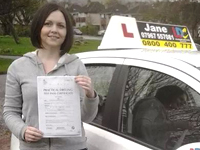 Jane is my second driving instructor as I wanted to have lessons well structured. 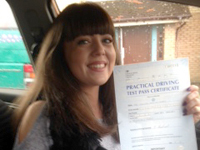 Her lessons are very well structured and she explained lots of details and skills required for the driving test. She is very supportive and comfortable to be with. 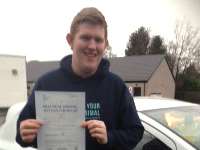 I passed my test at the first attempt. Thank you so much Jane. Jane was brilliant!! She is very organised and plans the block of lessons ahead which helped me personally to focus and get the best out of each lesson. Jane also tailored the lessons for me before the test so that we got over the things I needed to get sorted prior to the D-Day. She helped me relax and keep my cool which helped me immensely. Highly recommended instructor. Jane thank you so much. 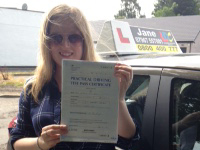 I passed my test with only one minor thanks to the lovely Jane. I had never driven a car before so I was really nervous but Jane made it so easy. I'm so glad that I picked Jane and I would recommend her to anybody. I'm going to miss her loads, she made the lessons fun but you are still learning. 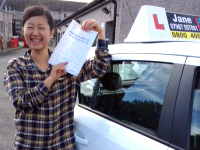 Jane was a brilliant instructor, she helped me rebuild my confidence when driving and made me feel calm and relaxed thank you so much! I would recommend Jane to anyone. Really easy to get along with and brilliant at calming the nerves! Got me through my test first time which is always a bonus! I had a great time learning to drive with Jane. I was able to take things at my own pace and was able to gradually increase my confidence until i was ready to pass the test. 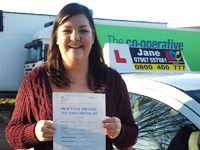 Jane is at a terrific instructor and she helped me pass first time round. She is extremely friendly which makes for a nicer drive. I would give her 10/10 and will be telling everyone to pick Jane. Since being with Jane I have had a great time with learning to drive. 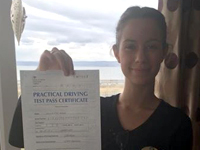 I would highly recommend driving with Jane, I am very very happy to have passed first time and without Jane's help I wouldn't have been able to. 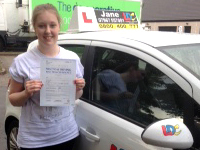 Passed first time all because of Jane!!! Thank you so much for putting up with me for so long! 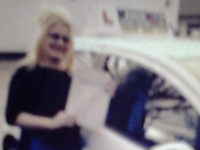 I passed first time under the LDC System and my instructor Jane. I am now a confident and safe driver thanks to her intruction. Cheers!! 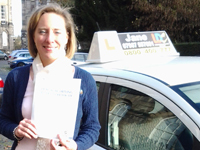 I passed my test with Jane - she was a fab driving instructor who explained things thoroughly and was always patient. I would recommend Jane to anyone looking to learn how to drive. Thanks again Jane! 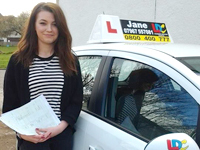 Jane is a fabulous driving instructor. Very helpful and very understanding, also, I'm her 5th pass this week! Thank you very much, instruction has been amazing. You make things easy to understand, bring a lot of knowledge whilst making the lesson fun and enjoyable. A massive thank you to Jane for being so fab! 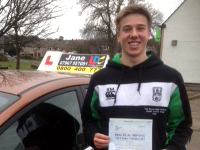 I passed my driving test first time and couldn't be happier. Jane is lovely and makes you laugh, feeling comfortable the whole time. Thank you! Jane is exactly what I was looking for in an instructor. She was friendly, relaxed and explained everything well. She was a calming influence in the car and was a great instructor. 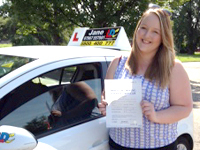 Thank you Jane for helping me become confident in my abilities and achieve a 1st time pass. 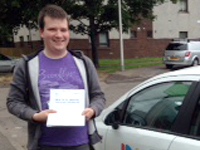 I passed my test first time today with only 30hours of lessons from the fantastic driving instructor Jane Cunningham! 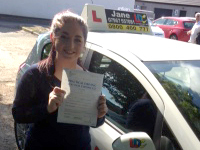 Jane is a great instructor, she is very friendly and knowledgeable and puts you at ease so you make the best of your lesson. I would definitely recommend her. Thanks very much! Jane is a fabulous instructor. She is very patient, knowledgeable and friendly. 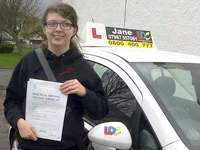 Jane is fantastic, The LDC system she uses is very efficient and she is a very good instructor. Thank you. You are a brilliant instructor, I would not have done it if it were not for you. Warmest wishes. I can't think of a better way to learn to drive than with Jane Cunningham. 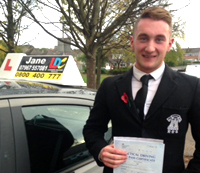 Lessons were very relaxed and I always felt confident and at ease. I found the LDC workbook and DVDs to be very helpful in giving me a better understanding of the road. Thank you so much for helping me pass, I couldn't have done it without you! Still can't believe I passed my driving test first time. 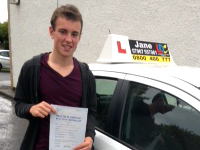 Couldn't have done it without Jane Cunningham, best instructor ever.